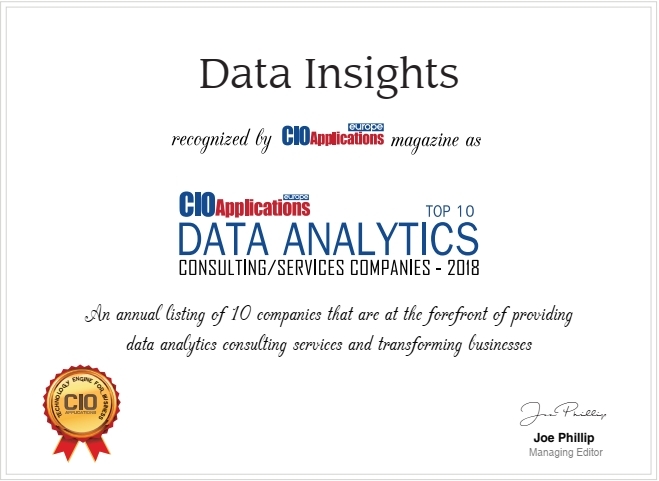 We are proud to announce that we have been chosen as one of the Top 10 Data Analytics Consulting/Services Companies 2018 by CIO Applications Europe which is an enterprise technology magazine. Our CEO, Pasquale Grippo, explains our services for the customers as follows: “We enable clients with a bird’s eye view of the data product lifecycle from data exploration through product development with a focus on assessing the feasibility of the business use case.” This service is provided through our data analytics, data scientists and data engineers. The goal of our IT consultancy is to go from development into production to deliver added value information to the customer. As the report of CIO Applications states “the [our] company addresses the prevalent lacuna in the industry where the importance of data exploration is often neglected.” We support our customers in understanding, analyzing and using their complex data through our expertise and our partnership with Ab Initio, AWS, Cloudera and Confluent. This past year has been a successful year full of growth and hard work. Therefore, we are honored to be ranked among the Top Ten Data Analytics Consulting/Services Companies 2018. Read full article here.